If you want an oceanfront property that is as deluxe as it is spacious, then Kishti Villa on Meads Bay West is for you. Similar to it’s sister villa, Kishti Villa East, West provides a variety of entertainment options in and around the villa like an in-home theater, an office, rooftop/patio gardens, and an infinity pool. Inside, you get a private chef, a butler, and maid service, while outside you’ll receive pool and beachside service, and a gardener. Take advantage of the fully outfitted gym and tennis courts, or relax and enjoy a wide selection of beverages served anywhere within the villa, by the pool, and even on the beach. Meals are no issue with the chef on hand and many local restaurants just a stroll away. Beachfront on Meads Bay Beach! Kishti Villa on Meads East is steps from the beach and water sports. 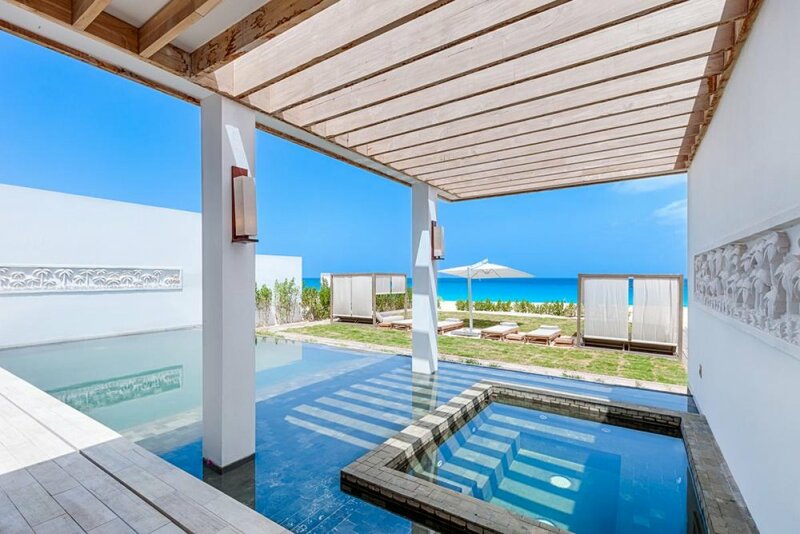 This luxurious Caribbean villa is perfect for group vacations, weddings, or family getaways. Mile-long Meads Bay has water sports, restaurants, and bars within easy reach of Kishti. There’s stand-up paddle boards and kayaks for exploring, and beach chairs and towels for relaxing. A row of loungers and daybeds rests between the powder-soft sand and the villa’s pool deck. The pool has a plunge area and a Jacuzzi tub that’s partially shaded, and the deck has two extra-long sofas and a shaded dining table. On the upper level terrace, there’s more daybeds and a shaded sectional. The ground floor has a Zen garden for morning meditation. Wall-to-wall sliding glass doors open to the warm, cozy living room and kitchen. A dining table sits between the kitchen’s chic countertops and the living room’s plush sofas. Guests can watch the flatscreen Apple TV from the living room, dining table, or kitchen. For next-level movie nights, check out the media room’s home theater and wraparound sectional. There’s also board games for simpler entertainment. This fully air-conditioned villa also has an alarm system, WiFi, and on-site gym equipment. All five bedrooms have an ensuite bathroom, flatscreen TV, and are exterior access only. Three suites have king beds, and two suites have twin beds that can be made into a king. One king suite is the master bedroom, and it’s twice the size of the other suites. The master sits on the middle level, and the other four suites are divided between the top and ground floors. Kishti’s full staff is made up of a housekeeper, chef, gardener, butler, managers, and security. There’s tennis nearby, and Long Bay is less than five minutes away. There is new construction next door. Please contact your villa expert for details. Directly on beautiful Meads Bay Beach! Welcome drinks and food platter, Welcome dinner (holiday and winter only), chef for lunch and dinner in high season, chef for two lunches and two dinners in low season; daily full a la carte breakfast, afternoon refreshments, bath and personal care products, beach service, phone calls to the U.S. and Canada; all house wines/liquors and beer (replenish able by guests); snorkeling gear, and private beach volleyball. Cost of food plus 15% surcharge. Car rental, grocery and beverage shopping (pre-arrival and during your stay), liquor and wine delivery, nanny service, baby equipment, spa services, yoga and personal training, photography, and private airport transfer/car service can be arranged for an additional fee.